It Happened in India: The Story of Pantaloons, Big Bazar, Central and the Great Indian Consumer is the autobiography of Kishore Biyani, written with the help of Dipyaman Baishya. 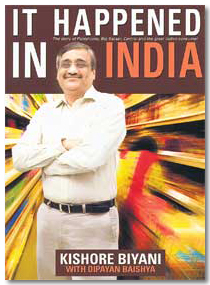 Kishore Biyani is highly regarded as the retail king of India. He is known as Kishoreji or KB among his employees, friends and family. The book takes the reader through Kishoreji’s journey of building a great retail business in India from scratch. Author recounts on how he started as an ordinary cloth seller in Mumbai and eventually how he established the giant retail business spread over a few hundred cities in India serving millions of Indian consumers. The unique and interesting point I liked about this book is: Kishoreji’s friends, relatives and employees of the company share their experiences about being associated with Kishoreji and give the reader a deep insight into Kishoreji’s personal and as well entrepreneurial abilities. Kishoreji takes the reader through his childhood days, college life and finally how he had left the usual way of doing family business and started his own journey on a road called entrepreneurship, which most of the young Indians now are aspiring to travel. Doing something that opposes the established system of beliefs is not an easy task. An entire chapter titled ‘Defying the Odds’ is dedicated to how he started Pantaloon Shoppe amidst very testing and difficult times. He talks about building emotional connect with consumers. He emphasizes on how he brought Indianness to the business and how he studied Indian consumers with passion. He confided that even till today he visits some of his stores and observes the consumers to understand their needs and their thoughts. KB emphasizes on relationships throughout the book: relationships with customers, employees, share holders and most importantly family and friends. He also emphasizes on building trust and the importance of mutual trust in relationships. Kishoreji has even shared about his failed businesses. KB explained about how he tried to enter into movie making in the bollywood but could not produce a huge success there. In a whole chapter dedicated to his bollywood stint, he shared his learnings from this failed attempt of movie-making. Its an inspiring story every budding entrepreneur should read. The book has something for everyone. If you are aspiring for a career in retail you have a lot to read from a man who built everything from nothing. If you are a casual book reader, even then you have a lot to appreciate and learn. Finally, it costs only 99 rupees! Go and get a copy for you and I assure you that the time and money you spent is worth the effort. Here are few inspiring lines I am reproducing from the book with all the due credit given to the authors. I based everything on one philosophy ‘Rewrite Rules. Retain Values’. Chase your dreams but don’t compromise on your belief system. Entrepreneurship is about thinking big, believing in your own ability and going ahead with huge risks even if you are aware that some of the ventures may not be successful. It’s also about making decisions, leadership, and about making your colleagues believe in you dream. By the time one manages to get out of the control of one’s family, one loses his zeal and becomes complacent with what has already been created. its Scary..!At this juncture when an optimist about the retail sector in India reads this book, he would hate it(both the book & retail). Cause this book begs to prove that the largest retail company in the country was formed by…fluke. The book is full of tales of Biyani’s hits and misses vouching for his anarchist approach in the whole gamble. People like Rama Bijapurkar, Ushir Bhatt, Sameer Sain have been penned as mere bystanders to the whole roulette. From a literary perspective, this would go down as an Indian take on – Made in America- Sam Walton. But as Biyani writes about his denial of regret for the premature listing of the company on the stock exchange, i feel even the book is a little premature. Biyani talks about the concept of Sabse Sasta Din and you would think he invented it, but actually ask any large format retailer and the would say Biyani just discovered it. (Anyways, he’s the first to pen it down). The book gives you a sneak peek into varied subjects like Memetics, Observational Research, Jonathan Livingston Seagull which sounds very clichéd of this genre of Business auto/biography. Biyani has tried to invent new concepts like India One,India Two which to me are very abstract, irrational and blur. At a certain point during the end somewhere the book looks like a PR initiative for the National Institute of Design and a certain design firm called Idiom Design. Biyani takes a dig at his critics in the press as well as the competition in terms of Shoppers Stop, The Piramals, Westside. But in his mention of FDI and about the FDI entrants in 1997 he mentions Dairy Farm-RPG, Nanz-Marsh Supermarkets-Escorts, but conveniently ignores the mention of the 3rd major entrant, Lifestyle which looks intentional. Overall the book is a good read for a person who’s new to Indian Retail, its also at a good price point of Rs 99, which i feel is a good tactic. But comes no where close to Made in America, which IHII tries to emulate. i feel as though i just heard Anu Malik’s take on Pink Floyd. Someone needs to add a few paragraphs into that essay. Nice review. I’ll check it out. nice post It just inspires me to read his book! Kishore Biyani rocks! @Lakshman Srikanth, thank for the add.